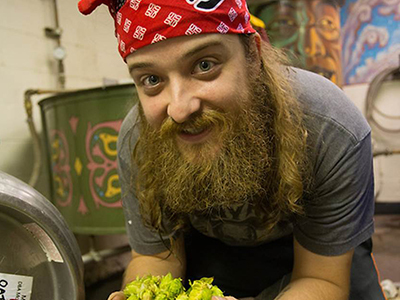 4 p.m. 'til 8 p.m.
One of our favorite McMenamins Brewers is heading south to start his own brewery. Come say farewell to West Linn's Jacob Willson and raise a pint to his next adventure. We will be pouring four of his fabulous brews: Mole Cream Ale, Whiskey Barrel-Aged Coffee Porter, Brew Hawaii Blueberry Pineapple Pale Ale, and his infamous Angry Reindeer Double IRA. Chocolate? Chili peppers? Cinnamon? Hey, don't you threaten me with a good time! This stuff is so good, you'll want to eat it with a spoon...or just drink it. I would recommend you just drink it. Sometimes the Oregon weather can be dismal and depressing. Lots of Portlanders have been known to take refuge on the islands of Hawaii. Well, I figured I'd bring the islands to y'all! And what better guide than the King himself? Elvis. Freakin'. Presley. Dreams come true in Brew Hawaii if your dreams include a hoppy, blueberry and pineapple Pale Ale. The night is young, and so are we, so grab a pint, while the moon is on the sea. Elvis has left the brewpub. Thank ya, thank ya very much. He's back, but he's not happy about it. We've all heard the story of a certain reindeer and his red nose. But, do you know how his nose got red? 'Cause he was madder than a wet hen sittin' on a cold egg. And you would be too, if you had to wait your turn for Kris Kringle to get out of the way. So, he ain't waiting this year. Nope, he jumped in line and said, '"get outta my way!" So now we have a festive beer, at a festive time. Festivus for the rest of us, I say. So, raise a pint for all those poor deer still stuck eatin' corn. Howdy partner! Sit down and take a break from that long day out on the range with this delicious Porter. The coffee flavor is robust and full-flavored, provided by the House Roast from McMenamin's Coffee Roasters. The roasted chocolate notes in the background are complemented by a soft alcohol warmth, thanks to Hogshead Whiskey soaked oak chips. Here you have another breakfast beer from the West Linn Brewery and another reason to drink even earlier. So, before you head out into the sunset, or head in to beat daybreak, grab a pint to make your trip a little more enjoyable.